On April 5, 2017: The first 25 one-ounce Gold Trump Dollars with Make America Great Again (MAGA) were offered by auction. 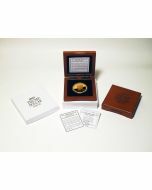 To identify this very special limited issue, each specimen was specially hand hallmarked with a “T” to permanently identify it as one of only 25 “Trial Strike” Gold Trump Dollars ever minted. 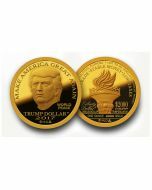 The first 25 MAGA Gold Trump Dollars are true “Trial Strikes.” And while they are not offered as “Proofs” because the obverse does not feature an ultra high relief (UHR) die, every Gold Trump Dollar looks like a proof and will most likely be graded as such! They are the very first specimens minted from brand new dies. They look terrific and have significant historical and collector value. 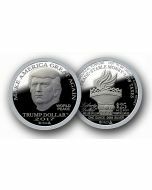 The obverse features the iconic engraved portrait of President Trump with his campaign slogan and personal mission for America: MAKE AMERICA GREAT AGAIN. 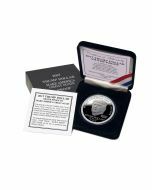 The reverse features the Liberty Torch with LIBERTY DOLLAR and the legend: FREE TRADE - STABLE MONEY - LOW TAXES popularized by Steve Forbes, himself a two-time presidential candidate. 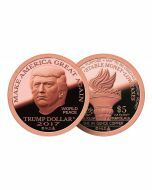 The Gold MAGA Trump Dollar is not a Piedfort! 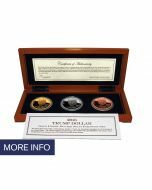 It measures 32mm in diameter and contains one solid ounce of .9999 fine gold as stated on the reverse, with the special “T” hallmark located just above the MSRP. To add to the distinction of this very unique and limited mintage of only 25 specimens, each Gold Trump Dollar has been upgraded with a secure metal presentation case and a special Certificate of Authenticity.